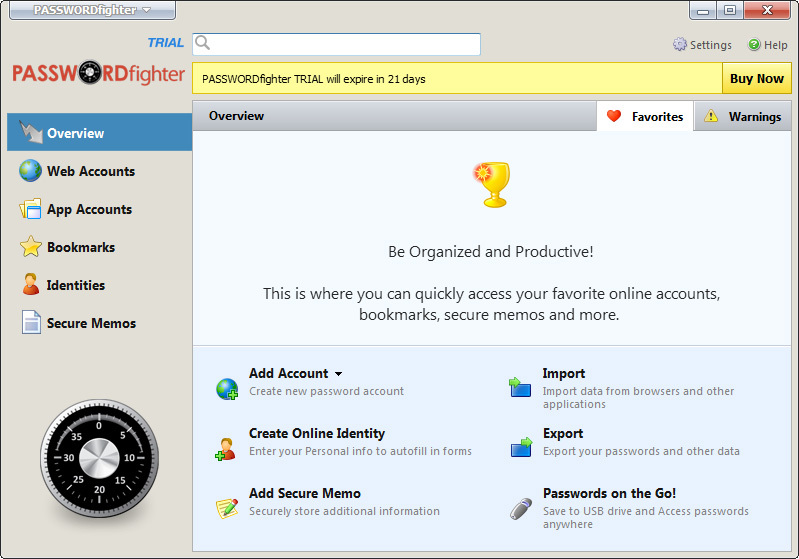 PASSWORDfighter is an effective and easy-to-use password manager that allows you to "Sign-In" with one click and more security. Whether you're banking, shopping, or e-mailing, all of your personal information is keep safe and secure in a hack-proof, encrypted database (nerdy term that means ultimate security).. All your passwords and logins are remembered for you - and you'll be automatically logged in to any of your password-protected sites. PASSWORDfighter not only saves your sanity, but it also protects you online too. The password generator helps you create the strong passwords you need, and stores everything in the hack-proof, encrypted database. Hackers can't get to your personal information, and you're protected from phishing attempts, keylogging, and Identity Theft.